The Catholic churches of St. Nikolaus and Assumption in Pattaya opened their doors to welcome a new pastor at the beginning of last month. Rev. 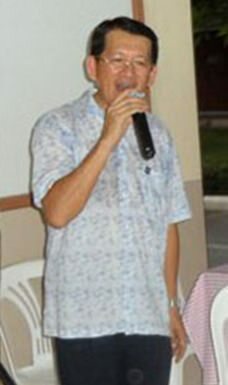 Peter Suraporn Suwichakorn hails from Nakorn-Nayok province and was baptized at the Redeemer Church, Saowapa in Nakorn-Nayok. After studying at the University Saengthem College in Nakorn Pathom, he decided that a life in the priesthood was his calling and following extensive theological studies he received his deaconate ordination on 15th August 1990, before finally getting his priest ordination on 6th January 1991 in Nakorn Pathom. 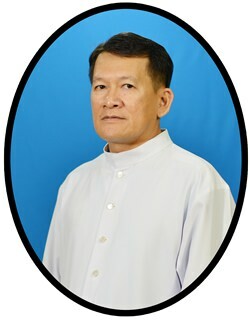 Pastor Peter Suraporn Suwichakorn – in his official photograph. The same year, 1991, Rev. 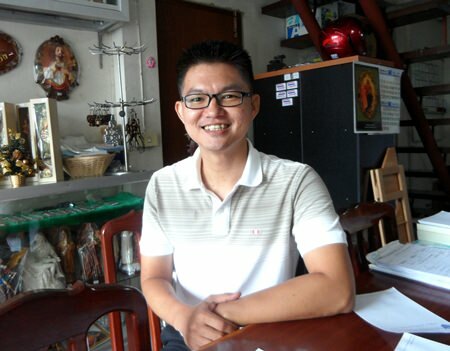 Peter took up the position of assistant pastor at the Mary Immaculate Cathedral in Chantaburi before becoming pastor in 2000 at the St. Vincent de Paul Church, Sa-kaew. His career in the cloth then took him to the Sacred Heart Church, Sriracha, and later, in 2005, to the St. Michael Church in Prachinburi. Further moves saw Rev. Peter take up posts at St. Joseph the Worker, St. Francis Xavier Thasala and Presentation of Mary in Temple churches, all located in Chantaburi, before finally becoming the resident pastor of Pattaya this year. Pastor Peter isn’t shy of displaying his singing talents. The favourite Biblical phrase of the friendly and softly spoken man who loves music and has good singing skills is, “You did not choose me, but I have chosen you and appointed you that you should go and bear fruits.” (John 15:16). To describe Pattaya’s new assistant pastor, John Baptist Nuphan Thasmalee, one could say he is a fresh faced young man with an ever-friendly smile and the first impression one gets is of a person with a modern style of thinking and wisdom. He also speaks perfect English. Fr. John in his official pose as a priest. 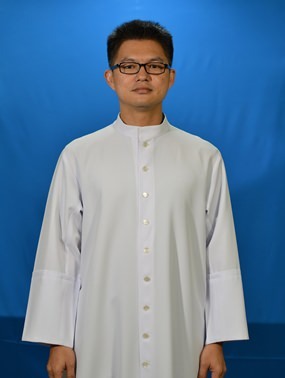 Father John was born in 1977 in Chantaburi province and looks much younger than his 37 years. He went to university in Bangkok to study accounting and worked for 8 months at a Burapha accountancy firm as an auditor. Only in 2001 did he decide to become a priest and later receive the deaconate ordination in Sriracha in 2011 and full ordination as priest in 2012. Father John previously worked as assistant pastor at the Sacred Heart church in Sriracha before taking up the same position in Pattaya. He is already sure that he will like it here as there are so many different nationalities represented and he firmly believes that all people, no matter what race, religion or background, are created equal in the eyes of God. Fr. John prefers to dress casually in private and is always ready to greet with a smile.